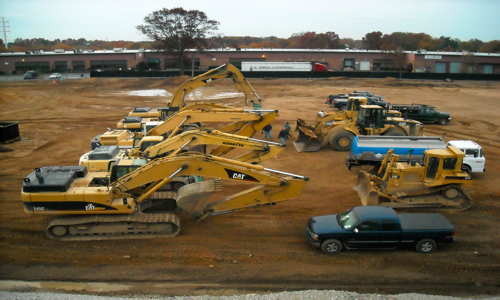 Hydraulic Excavators: Komatsu PC 400, PC 300, PC 220, PC 150, CAT-330LC, 321CLC, Mini 304. Backhoes: Caterpillar 446B, Dynahoe 190. Payloaders: Caterpillar 980G, 980F,966G, 966E, 950, 938. Bulldozers: Caterpillar , D7H, D6D, D4H, D4G, D3. Skid Steer Loaders: Gehl 5635, CLT130 High track. Soil Vibratory Rollers: Caterpillar 563B, Hamm 5625. Asphalt Vibratory Rollers, Dynapac CC142, Dynapac CC10. Off road trucks: Caterpillar D25C, Moxy 40T. Water trucks & Roll offs. Dump Trucks: 6 wheel dumps, 10 wheel dumps and dump trailers. Trucks & Trailers: Service trucks, flat beds, equipment trailers and tag trailers. Dewatering equipment including well point systems. Pumps from 2”– 8”. Numerous specialty attachments are available for various equipment: Multi processor, hydraulic hammers, hydraulic tampers and grapples, hydraulic shears and asphalt road grinders, automatic precast lifters. All small equipment and hand tools are also available for use as necessary. Snow plowing equipment and sanders.